Guido Gezelle (Bruges 1830 – Bruges 1899) was the most important poet of the nineteenth century to use the Flemish language. He is often compared to Gerard Manley Hopkins and not just because he too was a Catholic priest. 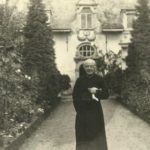 Both poets took a Franciscan delight in God’s creation; both steeped themselves in the possibilities of language, all but inventing words to help the alliteration flow. In the case of Gezelle, he really was forging a new language. French was dominant culturally in the new Belgian state and even poets from Flanders, like Émile Verhaeren, frequently preferred it. Flemish was in danger of becoming a rural dialect, the kind of thing that the poetry-consuming class only used to speak to their servants. 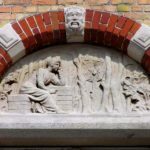 The cultural activists of the Flemish Movement were determined to rescue the language but, as we’ve seen in some earlier posts on this site, they were too often trapped in a simplistic language suitable for their moralizing precepts. Gezelle too was a fierce advocate for Flemish, but he was also determined to reshape the language for literary purposes. Modern Dutch would not do for him because it was the language of Calvinism, so he drew on the West Flemish dialect of his native Bruges. Yet one cannot label him a dialect poet: he rather used the spoken vernacular to construct a new, and idiosyncratic, poetic language. Guido Gezelle in Courtrai, 1898. From the Stichting de Bethune. One is less likely to encounter human beings in Gezelle’s poetry than animals, flowers, God, or all together in a celebration of the divine manifested in nature. However, one exception is the lacemaker to whom the poem Spellewerkend zie ‘k u geerne is addressed. Below we give the Flemish text and an, admittedly very rough, English translation. The poem was first published in 1893 in the Bruges review Biekorf which Gezelle had helped to found. The poem uses some well-known tropes associated with lacemakers, such as the ‘bolglas’, the focusing bottle of pure water which concentrated a light source onto the pillow, which we have already encountered in the poetry of John Askham. However, he avoided one stereotype, for his lacemaker is not old but clearly a young woman or girl. 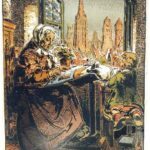 So strong has the expectation become that a lacemaker should be old that when Bruges Municipal Library acquired the manuscript poem in 2009 they described it as ‘Gezelle’s masterful description of an old woman lacemaking by the dim light of an oil lamp’! 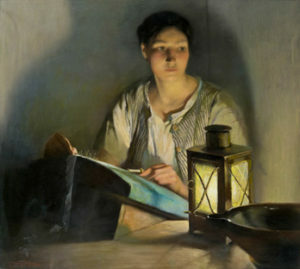 Given that the poet calls the lacemaker ‘kleene’ (‘little one’) and ‘lieve’ (‘sweetheart’), we suspect that the lacemaker in question was considerably younger than even this example, pictured by the Belgian painter Firmin Baes. Firmin Baes, ‘The Lacemaker’, 1913. We found this image on Pinterest and do not know its current location. 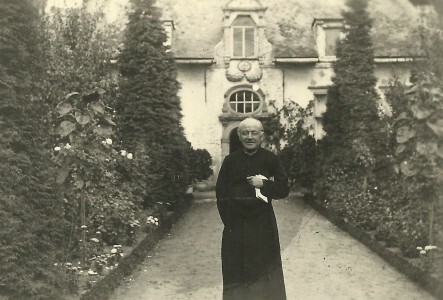 Gezelle, an anglophile, wanted to become a missionary to England (he had good connections to the British Catholic community in Bruges, and he was serving as chaplain to the English Convent in the city when he died). This ambition was quashed, apparently because his prominence on language and social questions had annoyed the ecclesiastical authorities. In consequence, Gezelle passed his entire life in the lace-making regions of West Flanders – Bruges, Roeselare, and Courtrai. However, it is not clear how much this poem was based on direct observation. Gezelle was intimately connected with the movement to preserve and revive Flemish folk culture and was familiar with the growing literature on lacemakers’ traditions and songs whose influence one can observe in this poem. One source was the collection of songs recorded by Adolphe-Richard Lootens (Bruges 1835- London 1902) from his mother Catherine Beyaert (born 1795), a Bruges lacemaker. Lootens, who worked as a surveyor before his move to London, was certainly acquainted with Gezelle. He contributed articles to the antiquarian and pious journal Rond den Heerd that Gezelle co-founded in 1865, and Gezelle reviewed Lootens’ collection of folktales taken down from his mother: Oude Kindervertelsels in den Brugschen Tongval (1868). Perhaps surprisingly, Gezelle was not very enthusiastic about Lootens’ attempt to represent Bruges dialect. Published in 1879, Lootens’, or rather his mother’s songs are present in this poem. Gezelle refers to the lacemakers’ custom of pricking their forehead with each pin before placing it in the pillow, in memory of Christ’s crown of thorns. This practice was recorded by Lootens as the accompaniment to a particular song sung by Bruges lacemakers at the end of the end of the eighteenth century: it continued for seventy-seven pins, the traditional number of thorns in Christ’s mock crown. 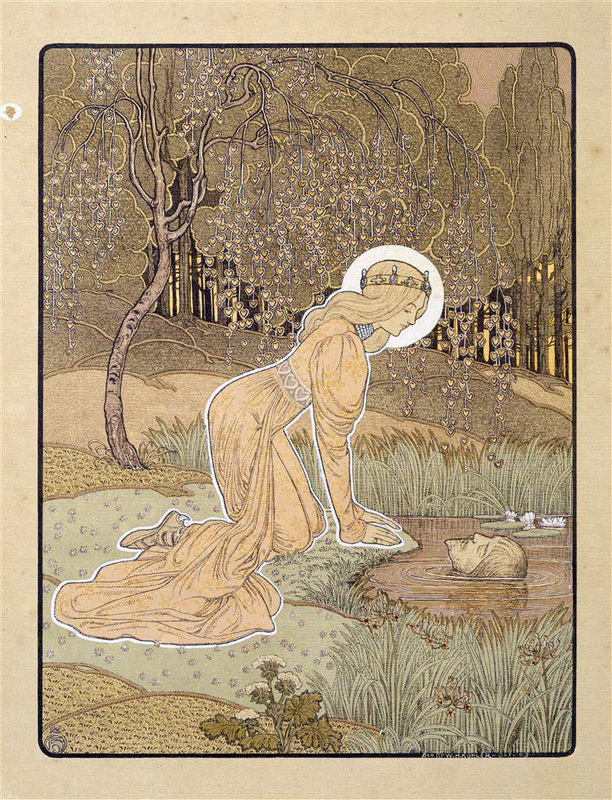 Illustration to the ballad ‘Heer Halewijn’ by Henricus Jansen, 1904. The ballad, though only recorded in modern times, is assumed to have a medieval origin. Source: Wikipedia Commons. The last five verses of Gezelle’s poem are in the voice of the young lacemaker, singing a song in praise of the Virgin Mary, protector of lacemakers like her mother Saint Anne (the patron of lacemakers in Bruges), and refers directly to the dogmas of the Immaculate Conception and Mary’s Perpetual Virginity. 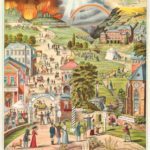 We might suspect that such a doctrinally informed text owes more to the priest than to folk traditions. Certainly I have found no song that exactly matches these verses, though a praise song addressed to the Immaculate Conception, and recorded by Coussemaker in Bailleul, is thematically very close. In West Flanders religious orders were very active in lace-teaching. In Bruges itself the leading lace-school was run by the Apostolate Sisters. Gezelle’s assumption that lacemaking was a holy craft, and that it might serve as an apprenticeship for life in a religious order, was widely shared. Indeed this message was inculcated in the lace-schools through the medium of song. According to a legend (of recent, literary origin, but widely disseminated), Mary herself had inspired a Bruges girl, Séréna, to invent the craft of lacemaking. The final vow to Our Lady of the Snows concerns a cult held in particular honour among lacemakers, and not only in Flanders but also in Catalonia . The story originates in early Christian Rome when a couple, intending to dedicate their wealth to the Virgin Mary, asked her to reveal how it should best be disposed. Snow falling in August on a nearby hill led to the building of the Basilica of St Mary Major there. However, the cult really took off with the Counter-Reformation. Before the French Revolution, Brussels lacemakers carried their lace to the Chapel of Our Lady of the Snows in that city to place their work under her protection and thus preserve its whiteness. According to an article in Rond den Heerd Bruges lacemakers did the same on 5 August before a statue of a similar statue of Mary in the Cathedral of Bruges. 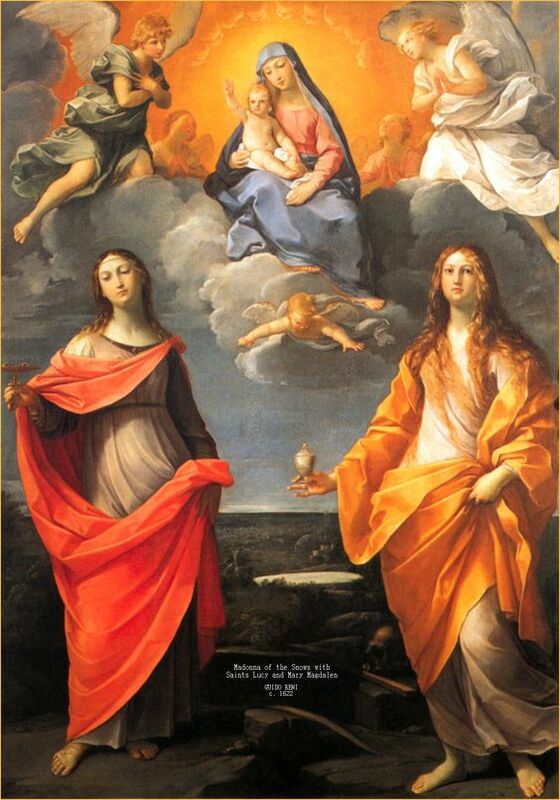 Guido Reni, ‘Our Lady of the Snows’ with Mary Magdalen and Saint Lucia (1623). Uffizi Gallery, Florence. 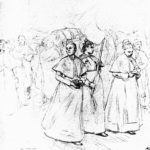 Gezelle’s poem encapsulates a particular vision of lacemaking, which in part explain’s the Catholic Church’s continuing efforts, in the late nineteenth century, to defend women’s home work in general and lacemaking in particular. The Church was not only the patron of most lace schools but was a substantial purchaser of lace as well. For Gezelle lace was a tradition that linked contemporary Flanders to its medieval glory days when songs like ‘Heer Halewijn’ were composed. And the medieval was preferable to the modern above all because it was an age of faith. Lacemakers earned little but, in this version at least, enough to supply their basic needs and thus save themselves from prostitution, the inevitable consequence of female poverty in the eyes of the Church. And lace itself was almost a holy textile: white like the head-dress of the Virgin herself, white like miracle snows in August. Lace and its producers were under the protection of Mary and her mother Anne. Those engaged in its production were materially deprived but spiritually rich, and would remain so in Gezelle’s eyes as long as they too remained ‘onbevlekte’, virginal, immaculate. ‘t vlugge allaam, uw kobbenet. krabbelt, op uw kussen neêr? dien gij van uw’ stokken laat. volgen, daar ge uw’ netten spant. meer als ik getellen mag! mij eens hooren hoe dat gat. ‘s konings dochter hij vermoordt. van wel dertig schakels lang. laat mij, laat mijn handwerk zijn. te uwer eere, o Moeder Maagd! As you weave your spider’s web. that you rapidly scribbleack and forth on your pillow? adorns the queen’s own dress. that you release from your bobbins. where you stretch your lace net. Many more than I can count! me hear again how that goes. he kills the king’s daughter. for at least thirty links in the lattice. your best friend in heaven. always be as white as snow. and in your honour, Virgin Mother! be like this virginal garment. 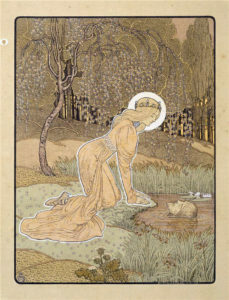 For an English biography of Gezelle see Gustave L. Van Roosbroeck, Guido Gezelle: The Mystic Poet of Flanders (Vinton, 1919). A recent bilingual edition of his poems is freely available: Paul Vincent (ed.) Poems of Guido Gezelle: A Bilingual Anthology (London, 2016). His collected works in Flemish are all online at the ever useful Digitale Bibliotheek voor de Nederlandse Letteren (DBNL). On Lootens and his relationship to Gezelle and other Bruges clerical antiquarians see Hervé Stalpaert, ‘Uit de Geschiedenis der Vlaamsche Volkskunde: Adolf-Richard Lootens, Brugge 1835-Londen 1902’, Volkskunde: driemaandelijksch Tijdschrift voor de studie van het volksleven 46 (new series 5, issue 1) (1946): 1-21; and Hervé Stalpaert, ‘Bij een honderdste verjaring Lootens’ kindervertelsels’, Biekorf 69 (1968): 273-5. Adolphe-Richard Lootens and J.M.E. Feys, Chants populaires flamands avec les airs notés et poésies populaires diverses recueillis à Bruges (Bruges, 1879), pp. 262-3: ‘De Doornen uit de Kroon’. Edmond de Coussemaker, Chants populaires des Flamands de France (Ghent, 1856), pp. 129-33: ‘De Twaelf Getallen’. Lootens and Feys, Chants populaires flamands, pp. 260-1: ‘Les Nombres’. Lootens and Feys, Chants populaires flamands, pp. 66-72: ‘Mi Adel en Hir Alewijn’; pp. 60-6: ‘Roland’. Coussemaker, Chants populaires des Flamands, pp. 60-2: ‘D’ onbevlekte ontfangenisse van Maria’. The story originates in a collection by Caroline Popp, Récits et légendes des Flandres (Brussels, 1867), pp 163-205: ‘Légende de la dentelle’. Popp was the first female newspaper editor in Belgium, and her paper, Le journal de Bruges, was francophone and Liberal in its politics. It is therefore surprising to find that she and Gezelle shared a similar set of ideas about lace. However, Popp allows her heroine to give up her vow of virginity and marry, which Gezelle would definitely not have thought an appropriate ending. Baron Otto von Reinsberg-Düringsfeld, Traditions et légendes de la Belgique: Descriptions des fêtes religieuses et civiles, usages, croyances et pratiques populaires des Belges anciens et modernes (Brussels, 1870), vol. 2, p. 74. Despite stiff resistance from local lacemakers, the chapel was demolished during the French occupation. Rond den Heerd 5, no. 36 (July 1870): p. 282 ‘Dagwijzer’.